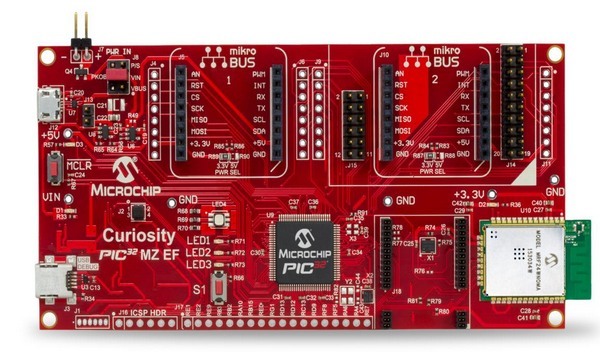 The Curiosity Development Board includes an integrated programmer/debugger ,an on board Wi-Fi-N module MRF24WN0MA-I/RM100 and is fully integrated with Microchip’s MPLAB X IDE. Each board provides two MikroBus expansion sockets from MicroElektronika and a Microchip X32 header to enable customers seeking accelerated application prototype development. Boards are fully integrated into PIC32’s powerful software framework, MPLAB Harmony that a provides flexible and modular interface to application development , a rich set of inter-operable software stack (TCP-IP,USB) and easy to use features. PIC32MZ2048EFM100 32-bit microcontroller with 2MB Flash, 512KB RAM, integrated FPU ,Crypto accelerator and excellent connectivity options.